Yep, it’s that time already – can you believe it? For many, the holidays is a time of the year where indulgence reigns supreme, and we decide we’ll worry about the consequences in the new year, “once things have calmed down”. But more often than not all that sugar, overindulgence, late nights and a few too many glasses of wine translates into starting the new year off with a (not so) lovely cold or flu. But it doesn’t have to be that way! We have put together some tips and tricks to keep you healthy all through Christmas and well into the New Year. Your liver has its work cut out for it during the Holidays so make sure you show it some love and keep it working efficiently. Start your morning by sipping on warm water with lemon to keep your liver functioning at its best. Sometimes we confuse thirst for hunger, so stay hydrated to avoid over-indulgence. Keeping your water intake up will also ensure that you’re flushing out toxins as effectively as possible. You’ll look and feel so much better for it – get that holiday glow on! Most holiday parties have a big selection of vegetables on offer (and no, we’re not talking about the potatoes), so fill at least half your plate with fresh vegetables before you move on to the big ticket items like turkey. Making sure you’re getting your fill of nutrients will keep all your organs singing and will also prevent you from wanting to crawl under the table for a mid-feast nap. Going out for a walk with your family after a big meal is not only lots of fun, but it will help you digest your food, lower blood sugar and even help you get a great night’s sleep. We’re not saying you need to avoid indulgence altogether… Because really, who can pass up Grandma’s famous Christmas Cake, or the Boxing Day family waffle tradition? The key is to prepare to indulge. Give yourself the right fuel during the day by having balanced meals that include lots of protein, vitamins, minerals and healthy fats that are going to give you energy all day long and keep your blood sugar nice and low. This smoothie is the perfect way to balance blood sugar, boost your immune system, aid digestion and give you all the energy you need to conquer the day – plus the green colour makes it oh so Christmassy! Garnish it with a few fresh cranberries on top and it’s a festive treat for the whole family! 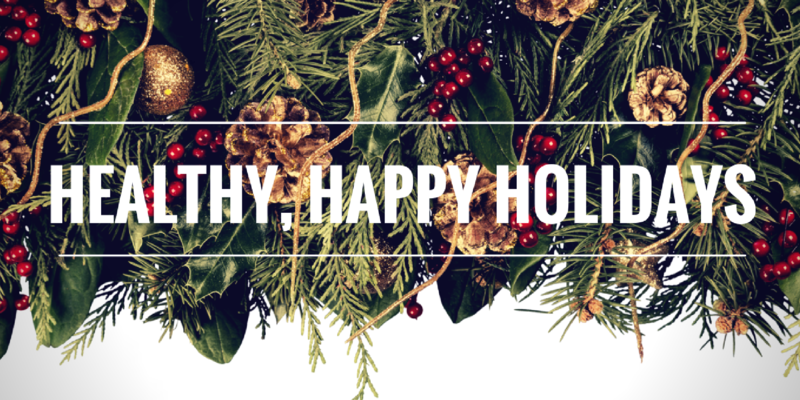 The entire team at Healthworks wishes you a very happy holidays and a healthy, happy new year!